Aimee Carter brings on the drama in the second installment of the Goddess Test series, Goddess Interrupted. After Kate’s summer in Greece with James, she returns to Eden Manor only to discover that everyone has gone to the Underworld in preparation for her crowning as Queen. What is supposed to be six months of learning her role as Queen of the Underworld, morphs into a fight for everything Kate holds dear- her family, her position, and her relationship with Henry. Goddess Interrupted has made me look at every single character in this series in a different way. So many secrets of their pasts are revealed that took me by surprise. I feel like I’ve been able to see them more in their god and goddess natures. Kate Winters will be the one to go against the grain. Already, she’s decided what kind of goddess she will try be and how she will handle her relationships. In Goddess Test, Kate was an extreme worrier. She never tried to see past her worries for what could be positive outcomes. I still think this is true of Kate, but she’s trying to improve, trying to not let every misunderstanding bring her down. Her relationship with Henry is so strained because she worries about whether he loves her enough or if she’s a replacement for Persephone. I do sympathize with her because she tries so hard to believe that she’s made the right choices regarding taking the job and becoming Henry’s wife. Kate doesn’t join in on the action because she’s new to her goddess body and powers. I wasn’t thrilled that while the council members went off to fight Cronus, King of the Titans, Kate stayed in the Underworld picking at her self-esteem. But, when she volunteers for a mission that will help their endeavors I perked up at the thought of seeing Kate physically contribute. 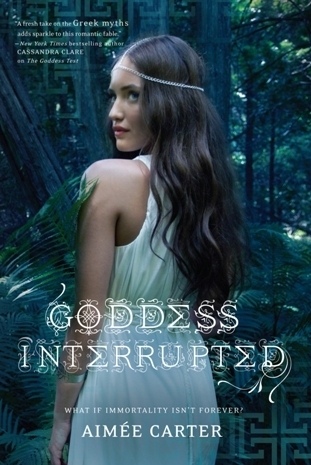 Carter closes Goddess Interrupted with the most saddening and explosive revelations. I can’t even fathom what will come of Kate and the other gods and goddesses in the next installment, Goddess Inheritance.